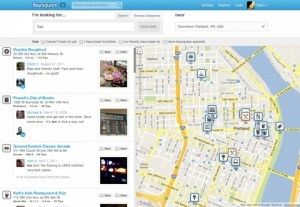 Foursquare just took another step with local recommendations by launching a new web version of Foursquare Explore. Last March during SXSW 2011, Foursquare launched explore for iPhone and Android mobile, allowing users to find things to do nearby, and now has brought this same functionality to the web. Explore's suggestions are powered by places you've been and frequented, the places your friends have visited, the categories and types of places you prefer, what’s popular with other users, the day of the week, places with great tips, the time of day and a whole bunch of intelligent criteria. This move by Foursquare shows the power of the checkin and applying your checkins, and your social network’s checkins history toward local recommendations, shaping the places you will go in the future. The benefits offered by this type of socially driven local recommendations, creates an powerful new set of incentives for mobile users to check-in, one that goes beyond badges and mayor-ship. Foursquare Explore shows the local check-in has definitely come of age.